HomeInformation CentreShould I set up a SMSF? Choosing to setup a self-managed super fund (SMSF) can provide you with many benefits, including greater control over your investments and potentially higher returns than other types of super funds. But it's not always that simple; you need to make sure a SMSF is the right option for you. For expert advice on the best type of super for your circumstances, get in touch about our SMSF accounting services. The biggest benefit of setting up a SMSF is the control it gives you over your wealth and investment strategy. Controlling your own investment strategy, while also getting professional advice, gives you the opportunity to greatly improve your returns. Controlling your investment strategy allows you to match your investments to your current goals and stage of life. For example, young people often choose to build up a property portfolio in their SMSF which can be more difficult to do with their personal assets. As you approach retirement, on the other hand, you can choose the exact amount of income you want to draw from your SMSF and choose the right investments to generate that income. An SMSF can also give you protection from downturns in the market since you have control over when you buy and sell investments. During the Global Financial Crisis, many superannuation investors pulled money out of the super system which forced fund managers to sell assets to pay out cash to the investors who wanted their money back. Unfortunately, this was the worst possible time for the fund to sell assets and had a negative impact on the value of the fund. You will never have this problem with a SMSF since you are in control. While there are many benefits of SMSF setup, it may not always be the best option for your individual circumstances. This means that you should only set up a SMSF if you are going to take an active interest in your super. You also need to consider how much money you have for your SMSF setup. In most cases, you will need at least $200,000 in your SMSF for it to be viable. Finally, you should always get professional advice for your SMSF setup and maintenance. Professional advisers can help you shape your investment strategy and handle all of the compliance requirements for you. 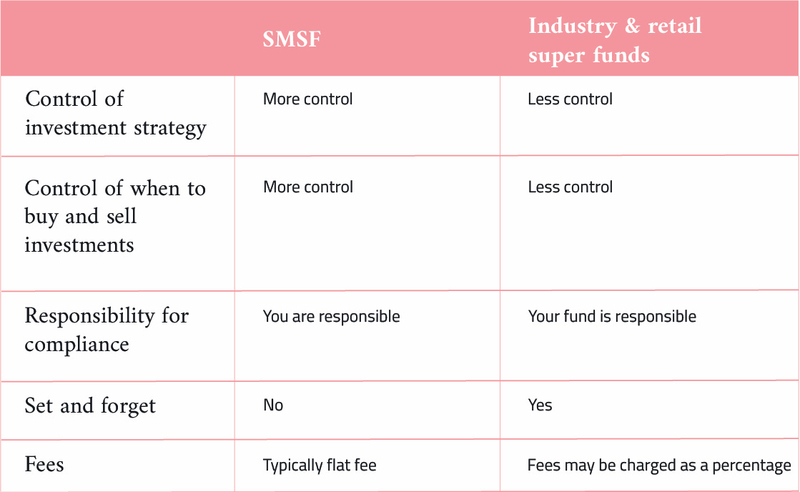 If you are considering a SMSF vs. an industry fund or retail fund, there are a few questions you need to ask yourself to determine the best option for you. Why do you want to establish a SMSF? What do you want to achieve from your super? How much money do you have to start your SMSF? Do you understand your responsibilities? What help do you need when running the fund and the investment strategy? Preparation and planning are essential if you want to get the most out of your SMSF setup. If don't have a clear answer for any any of the above questions, then you need to get professional advice before you set up your SMSF. If you have a clear answer for each of these questions, you still need to get professional advice to ensure your SMSF is compliant and your investment strategy is sound. Ultimately, a SMSF will give you more choice and control over your investments and wealth. And if you want to make the most of your super, you need to get expert advice. At Liston Newton Advisory, we will ensure your SMSF is compliant with all ATO regulations and provide invaluable advice on your investment strategy. Our team will match our investment strategy with your wealth goals and personal circumstances. To get expert advice or to get started with your SMSF, talk to us on [phone].